The Solo-II Custom Electric Guitar features a single-cutaway mahogany body with a maple top in Aged Black Satin finish, and a set-in mahogany neck with easy access to the upper registers. The ebony fingerboard has a comfortable compound radius and pearl block position markers. 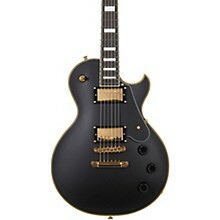 Electronics feature Schecter USA Pasadena and Pasadena Plus humbuckers for powerful and cutting tones. Controls include a 3-way pickup selector, individual volume controls and a master tone with push/pull coil-tapping. Additional features include Gold hardware, TonePros tune-o-matic bridge, TonePros T1Z Tailpiece, and Schecter locking tuners, which provide excellent sustain and tight intonation. Case sold separately.